Economist Robert M. Solow, Institute Professor Emeritus, and Kenneth N. Stevens, Clarence J. LeBel Professor of Electrical Engineering, are among this year’s recipients of the National Medal of Science. President Clinton today named 12 of the nation’s most respected researchers, three of them Nobel Prize winners, to receive the 1999 awards. Nobel laureate Solow will receive his science medal in economics. Prof. Stevens will receive a medal in engineering for his research in speech sciences that laid the groundwork for many of today’s speech synthesis and recognition technologies. Honoring the discoveries and lifetime achievements of the nation’s top scientists, the Medal of Science recipients are a diverse group that: created new scientific fields such as conservation biology and speech sciences and led to discoveries that determined why the ozone “hole” exists, among other things. “The contributions of these scientists are so profound, so connected to our everyday lives and so lasting that these medals go only a short way to express the gratitude the nation owes them,” said Rita Colwell, director of the National Science Foundation (NSF). The new medalists will receive their medals along with five awardees of the National Medal of Technology, which were also announced today, on March 14 at the White House. David Baltimore, former faculty member at MIT, president of the California Institute of Technology (Caltech), is one of three new medalists to have won the Nobel Prize. Baltimore made a key discovery of a protein carried in cancer-inducing viruses that reverses the ordinary flow of information in biological systems, leading to further discoveries of cancer-causing genes. Baltimore’s discovery was made simultaneously with Howard Temin of the University of Wisconsin, for which they shared the 1975 Nobel Prize. Solow won the 1987 Nobel Prize for demonstrating the critical importance of technological advances on economic growth. The other recipients include chemist Stuart A. Rice and physicists James W. Cronin and Leo P. Kadanoff from the University of Chicago. Nobelist Baltimore, along with Jared Diamond, physiology professor at UCLA School of Medicine, and Lynn Margulis, a University of Massachusetts distinguished professor will receive Medals of Science for their work in the biological sciences. In addition to Chicago’s Rice, chemistry medals will go to John Ross, a professor of chemistry at Stanford University and Susan Solomon a senior scientist at the National Oceanic and Atmospheric Administration (NOAA) in Boulder, Colo.
Felix E. Browder of Rutgers University and Ronald R. Coifman at Yale University were named to receive Medals of Science for mathematics. Congress established the Medal of Science in 1959, which NSF administers. Counting today’s recipients, there have been 374 medals bestowed on leading U.S. scientists and engineers. How people move the tongue, lips, and other articulators fast enough to accomplish speech is one of the classical puzzles of speech science. Kenneth N. Stevens has shown that many of the distinctions between speech sounds utilize special non-linear relations between articulation and acoustic output that enable speakers to produce correct sounds without having to hit all of the individual articulator targets with particular accuracy. In this way, he has unraveled an important part of the mystery that shrouds our ability to produce and understand speech. Dr. Stevens, who received the Sc.D. 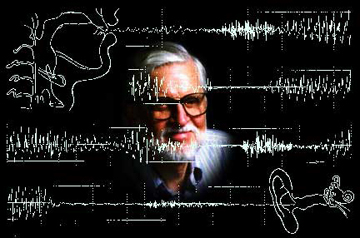 in electrical engineering from MIT and bachelor’s and master’s degrees in engineering physics from the University of Toronto, has pioneered contributions to the theory, mathematical methods and analysis of acoustics in speech production, leading to the contemporary foundations of speech science. Stevens’ theoretical work on acoustic properties of speech sounds that comprise the linguistic elements of language has led to the contemporary foundations of speech science. His theoretical work on acoustic invariance has defined unifying principles that have integrated major portions of acoustic phonetics, phonology, speech science and linguistics.